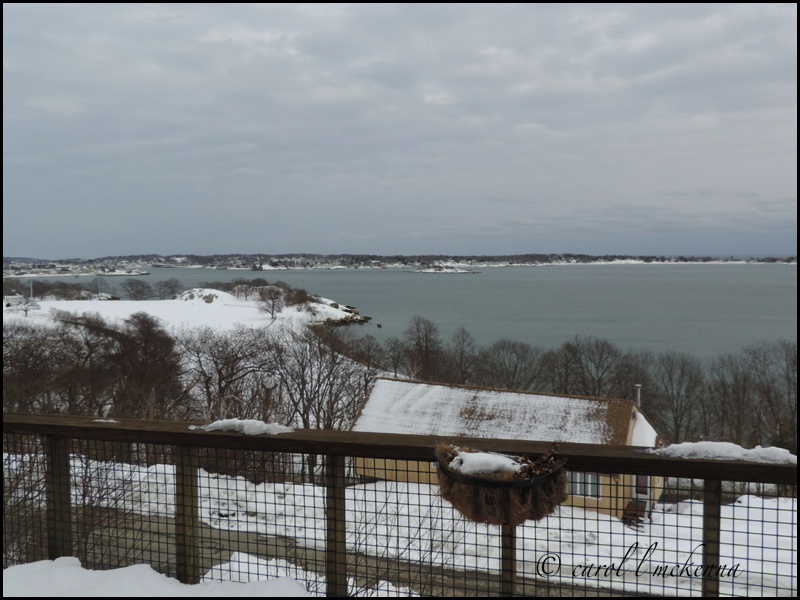 Very 'scenic' on Cape Ann MA in all seasons. Done with Winter, I am. 'Hey, it is not snowing!' Looks familiar! 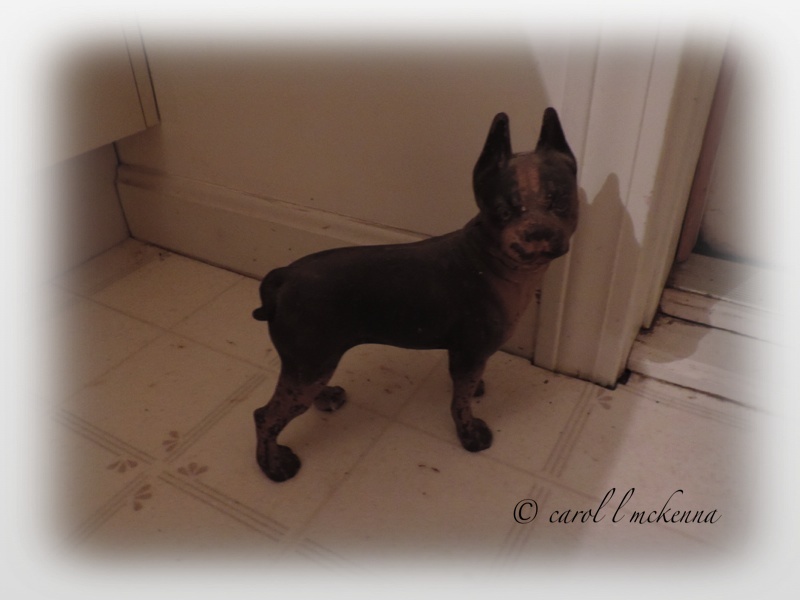 Antique Door Stop 'Critter' guarding Muse Dog's food cabinet. 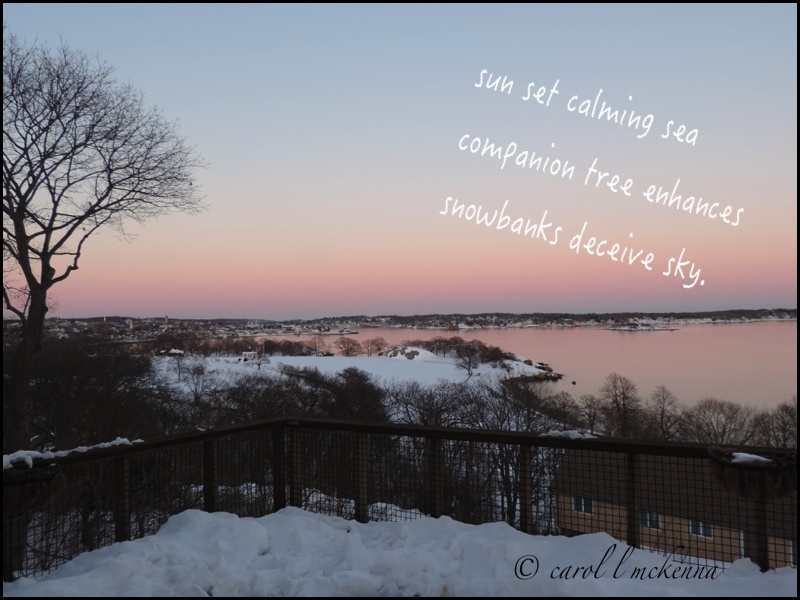 Magical pink sun set on Cape Ann MA Friday night ~ Snow to follow again on Sunday. Your posted comments are keeping us warm and cozy. thanks! Love the light over the bay... and a great quote. You have more snow than we had here in this winter. Holy Spokes - that's a lot of snow, Carol! In your photos snow looks so beautiful. So beautiful. So cold. Had to laugh at me. After enjoying your little furbaby on the deck, I was trying to figure out was the dog at the door was. Then I read the caption. Face palm, time. 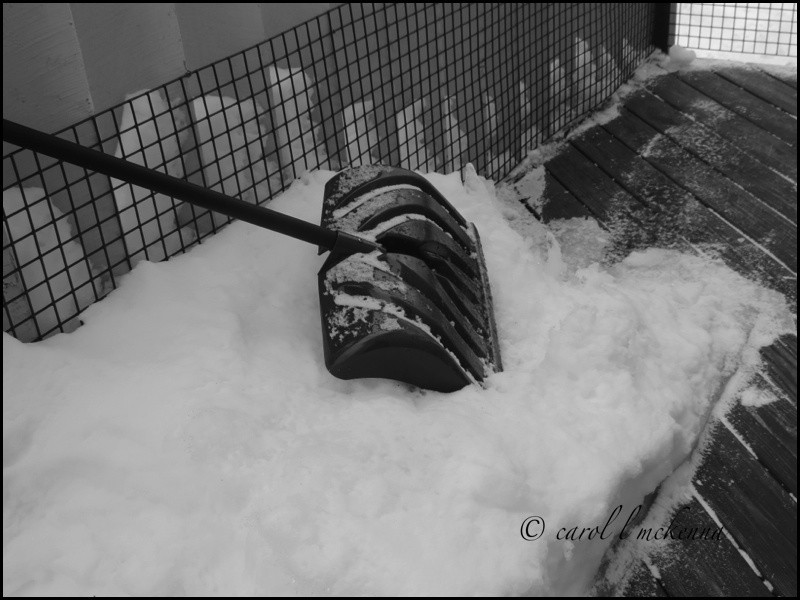 Hopefully that snow shovel won't be needed in another month. I'll miss winter though. The snow by the water is so enchanting. And your little queen looks so adorable peering at her world. Beautiful pictures, I love your doorstop critter. Oh dear - lots of cold snow! Excellent photo. 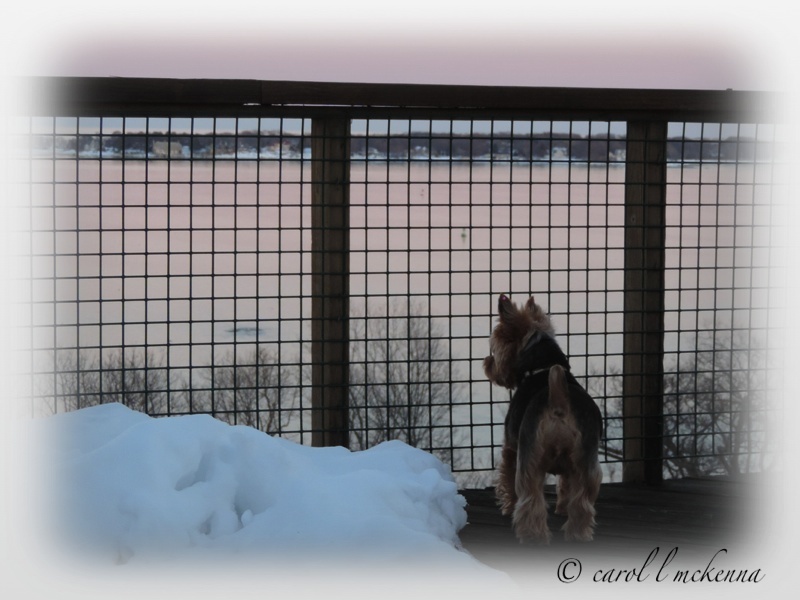 Hello Carol, I love your Queen looking over her domain.. And scenic shots, the pink sunset is lovely.. Thank you for linking up and sharing your post.. Have a happy weekend! The last shot of the water turning kind of pink is really interesting. I'm sure everyone in the Northeast is getting really tired of scooping snow! love the pink glow in the skies! A great serie, and your b&w photos are nice! Glad you and little Artmuse Dog are keeping warm and cozy in this crazy weather. yes, beautifu, but ENOUGH! Artmuse dog looks like he's yearning for it go away too:) LOVE that antique doorstop! I have one but it's a big bug-not so cute. Your photos are beautiful but it does look cold.....I love the pink glow! Lovely but honestly gives me chills to look at that snow! You have an amazing view out over the bay. Stay warm! Love the pinkish tones. I'm still waiting for snow, so quite envious of the top shot. Hi! Very beautiful scene photos! I like your Haiku very much. Thanks for sharing. Beautiful shots and words. 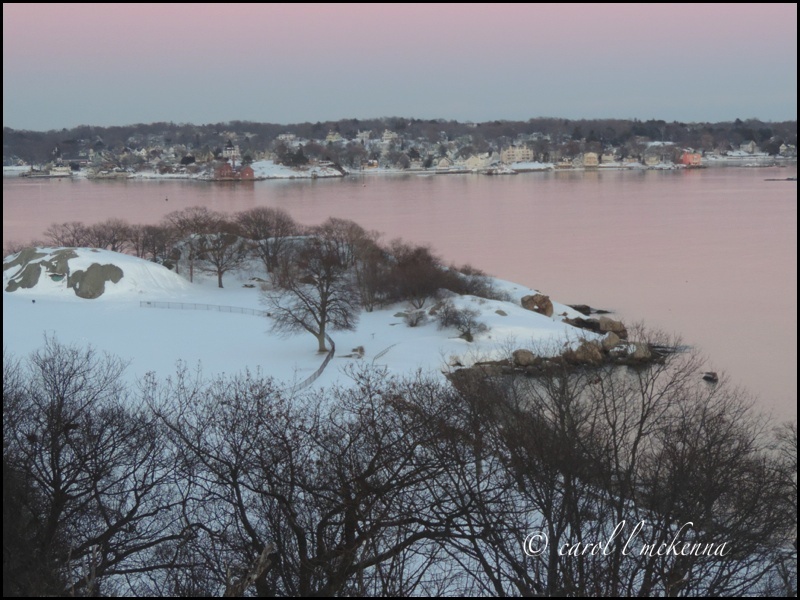 I love the pink sky and water in conjunction with the snow. Lovely colours, the harbour lead picture is my favourite. Good afternoon. Such superb photos you have shared. Hope you have a nice week. I am freezing when I see your pictures ! I just love your dog. I can see how cold it is there too. still it would be better than the heat we have here. Beautiful photos! I really like Leonard Cohens music and lyrics. Without trees as companions, where would we be? Your snow is beautiful, but I do hope you get a break. The pink sunset looks magical. That's a beautiful photo. Snow always makes things look so pretty.